6 Most Dangerous Words… “I thought it would go away!” Symptoms are the body’s warning that something is not working right. Headaches are NOT normal Back pain is NOT normal Numbness & tingling is NOT normal. The human body can live five days without food and water, minutes without air, but without a nerve supply, life cannot exist. Nothing happens in your body without the involvement of the whole nervous system. As a chiropractor I don’t treat the symptoms, rather I locate and correct the nerve interference which allows the body to do what it does best…heal itself. Chiropractic adjustments assist in the healing process by reestablishing the nerve flow to its optimal level. This allows the proper communication between the brain and the body. Did you know a seven-year study showed that patients who saw a Chiropractor regularly experienced; 85% less pharmaceutical costs 62% fewer surgeries 60% fewer hospital admissions 69% fewer days in a hospital 85% fewer outpatient procedures SPECIAL OFFER Detailed new patient history intake • Spinal & central nervous system new patient exam • Specialized diagnostic testing • Digital x-rays if indicated • Detailed report of all Doctors findings, analysis & recommendations. $47 $250 Value For Only Expires December 31, 2017 Medicare/Medicaid Rules Apply Thomas Edison said, “The doctor of the future will give no medicine, but will interest his or her patients in the care of the human frame, a proper diet and the cause and prevention of disease.” Dedicated to reversing Take care of your body. It’s the only place you have to live!! Call us today!! 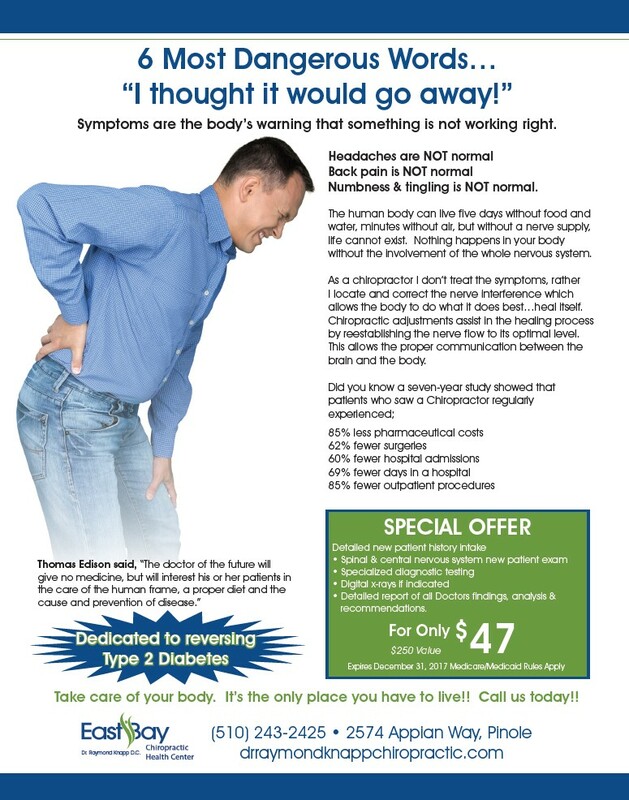 (510) 243-2425 • 2574 Appian Way, Pinole drraymondknappchiropractic.com Type 2 Diabetes Dr. Raymond Knapp D.C.